New Orleans remains one of the most popular and mystical cities in the United States. The Big Easy is rich in history, culture and home to some of the best food found in America. In fact, just thinking about it brings me back to my visit last year and the incredible plate of fried chicken, red beans and rice that I enjoyed thoroughly. Spending the majority of my time in the French Quarter on Bourbon Street, I felt as if I had stepped back in time to an era when New Orleans was also one of the most infamous cities in America, filled with pimps, madams, prostitutes, escorts, intelligence operatives and mafia bosses, most notably the legendary Carlos Marcello. Kent “Frenchy” Brouillette (1935-2015) teams up with Matthew Randazzo and brings us the story of his life from his humble beginnings in Marksville, LA to his time in the Big Easy and his association with underworld figures such as Carlos Marcello, Norma Wallace, Diamond Jim Moran and Dutch Kraut. And what we come to learn is the incredible story of one of a legendary figure in the history of the New Orleans underworld. I do have to admit that I’m a sucker for good true crime stories and biographies of those who at one time were entrenched in the street culture. I find that crime figures are usually the best readers of people and reveal to us some of the darker sides of human emotion and psychology that many would second guess exist. Frenchy fits right in to my expectations and his revelations were far more interesting than I could ever have imagined. My biggest shock is that I had never heard his name prior to reading his book. One of the most interesting parts of this incredible book is its relationship to the assassination of President John F. Kennedy. 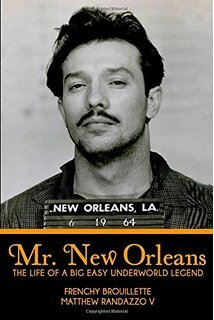 Thanks to Jim Garrison, who is also covered in this book, New Orleans was put into the spotlight with the failed trial of businessman Clay Shaw in the late 1960s. I wouldn’t say that this book is a smoking gun, but for students of the crime, the information about the characters at the focus of Garrison’s investigation and Oliver Stone’s ‘JFK’ is priceless. And after reading this book, you just might view the crime in a completely different light and have a new found understanding of the City of New Orleans. Posted on March 14, 2016, in Biographies and tagged Frency Brouilette, New Orelans. Bookmark the permalink. 1 Comment.